Danilia is a unique replica of a traditional Corfiot village. 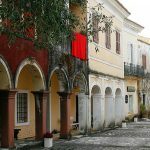 Authentic, colourful, with narrow streets and unique architecture the village is nestled within the beautiful nature of Corfu. Danilia is a unique replica of a traditional Corfiot village. Authentic, colourful, with narrow streets and unique architecture the village is nestled in the greenery of Corfu. The Village has hosted several movies, such as James Bond “For your eyes only” and most recently “The Durrells”! At Danilia there are 2 open air squares, a graphic church, a teaditional caffe, a large open air taverna & also the largest indoor taverna of Corfu Island!